Throughout history, musical instruments have never been far from man's reach. They have soothed and inspired him in times of trouble and sadness. They have also helped him to express his deepest feelings of love, joy and reverence. 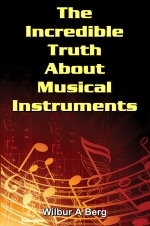 Because of such widespread usage, musical instruments have become commonplace. No one questions their origins. They are taken for granted by almost everyone. So much so that the world doesn't even suspect that there has been a Satanic plot behind the development of certain musical instruments that has had ~profoundly evil and God-dishonoring effect upon society!